Maths and Science Shows and Workshops for Schools UK wide/Magical Entertainment for Families, Venues and Corporate Events in Sussex, Kent, Surrey, London and Hants. 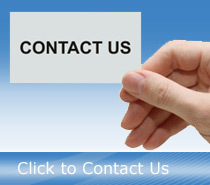 Please click on the yellow badge on the side bar to leave reviews or read reviews posted by previous clients. ‘It’s Magic Time’ is proud to be participating in the Adur and Worthing Business Awards, as an official supporter, providing close-up magic during the awards ceremony. 15/10/18. Delighted to announce we have been shortlisted as finalists in the category of Innovation. The Gala Dinner is 16 November. Fingers crossed and a big thank you to all those who nominated us for your support. 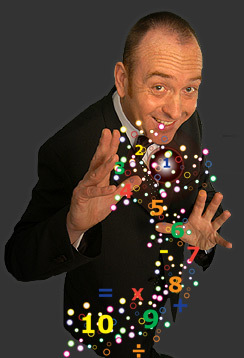 Discover more about Tony’s maths magic or magical science for schools by visiting the schools home page and dedicated maths and science pages. Tony has 12 years experience visiting schools everywhere from the South Coast to the North East and West of England presenting shows and workshops. See here how they can enhance your next maths or science focus event. Teachers can access a wealth of further information including prices, example timetables, schools visited, teacher resources and much more. 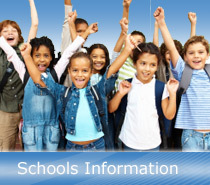 Teachers who came across this site via another route please contact us to have member login details forwarded to you. School visit prices for the whole of 2018/19 remain the same as last year. To confirm prices contact us or logon. Delighted to announce, that when arranging a day visit, schools can now opt to include a free twilight session directly after the school day. There are three options. 1. A family learning session to support schools with the inclusion of families in school life, and to promote maths at home. 2 .A magical science family workshop 3. A staff meeting session, sharing with teachers creative ways of teaching maths or science. Thank you so much for visiting our school and providing such a fantastic day of mathematics and science awe and wonder for all our children. The feedback from staff and pupils alike was incredibly positive and everyone felt that you pitched the sessions just right for each phase group. The children really enjoyed your exciting, magical, enthralling sessions and were inspired by the way you brought maths and science together in such a brilliant way. Feedback from parents and friends who attended the twilight session was also hugely positive and so thank you for a brilliant day’s contribution to our Maths and Science Week. 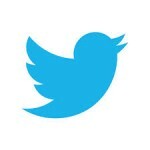 I just wanted to feed back to you that the teachers and children really enjoyed your science assemblies. What was said was that the children seemed to really understand the science through the demonstrations you chose and that these could be replicated easily back in class. Thank you for a great two days. Juliet, Science Leader. I just wanted to email you to say a massive thank you for coming to visit us on Wednesday. The staff and children thoroughly enjoyed your input and you really did inspire and WOW them! I am looking forward to having you here again very soon. Dan, Headteacher. 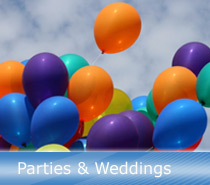 Visit the parties/weddings and corporate/venues pages for ideas on how to give your next event a magical touch. …then here you will find plenty of ideas to show how magical entertainment can help make your party, dinner or wedding a resounding success. 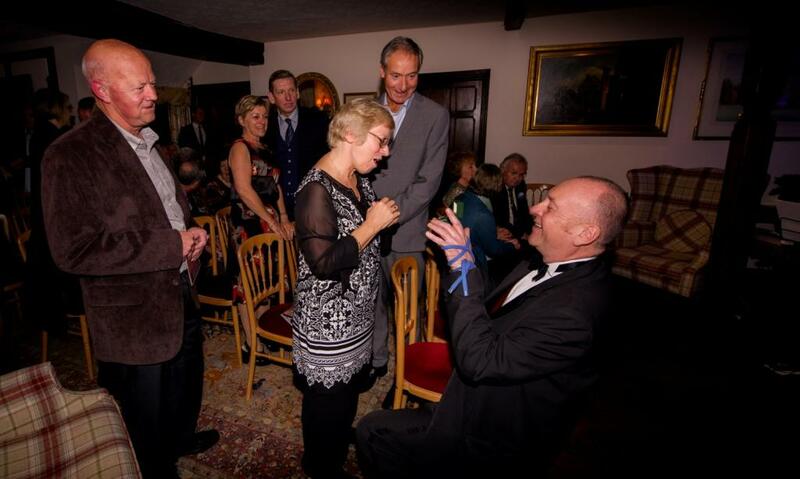 A touch of magic at Lea Graham Events 30th Anniversary. Booked Tony for my husband’s 30th, we had a Vegas themed party. Tony was the first person I booked and was great at helping with recommendations for other bits. He was brilliant very friendly and worked so well with everyone. He even added a little balloon making at the end for the kids. Would highly recommend made the perfect addition to the party. Thank you. We hired Tony for our daughters christening yesterday, he was amazing, all of our guests found him very entertaining, it was very relaxed and we enjoyed having him there going around the tables keeping the guests amused, the kids loved it and the balloon animals at the end was a really nice touch. I wouldn’t hesitate to use Tony again and one of our guests is going to use him for her wedding! Thankyou Tony you were fab. Our 60th wedding celebration was enhanced by Tony creating an additional dimension to the occasion. All ages, all guests gave us positive comments after 2 hours of table entertainment. His close-up tricks were amazing. We were particularly grateful for the time he spent with our young grandchildren (including twin boys of 6 years); they continued doing the tricks at home!